Charles and Shirley White worked for the Salvation Army in a Lynchburg, Virginia shopping Mall. They provided clothing and toys for children at Christmas time. The Whites listened to the Christmas wishes of children who might not otherwise get gifts. Then the couple wrote the kids’ gift wishes on cards that featured angels. The cards would hang on a Christmas tree in the mall, and shoppers could take a card to provide gifts for a child. More than 700 kids were served the first year of that program (1979). When the Whites were transferred to Tennessee, they established an Angel Tree Program in Memphis. 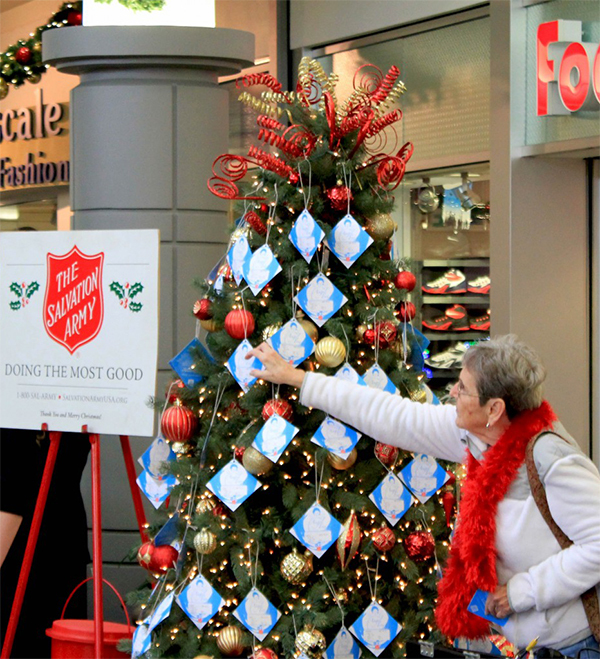 Shortly thereafter, press coverage and momentum lead to the establishment of the Salvation Army’s Angel Tree Program across the country. Jimmy Wayne’s introduction to music came in the form of a guitar he received through the Angel Tree Program when he was eight-years-old – a random act of kindness from a caring person. The guitar, the first gift he ever received, ignited Wayne’s love of music. That love took Wayne down the path of becoming a musician, and eventually, an award winning country music star. To “do his part” Wayne tells the story of the Salvation Army’s Angel Tree Program in a book he wrote and in one of his hit songs, Paper Angels. Wayne hopes the song inspires people to participate as gift givers in the Angel Tree Program. Wayne also mentioned in his lyrics that he’d like to do more to help kids. And Wayne wound up doing a whole lot more. In the middle of his career, Wayne decided to take a break from music and use his stardom to help foster youth in ways that go beyond lyrics – he focused on providing support and raising awareness of the plight of foster youth so others would be inspired to help as well. Wayne’s efforts were successful. Wayne’s efforts contributed to legislation in California and Texas that will help thousands of foster youth in situations that mirror his own childhood. He is also developing housing for homeless youth and has raised money and provided support for kids in need. It’s amazing what one act of kindness – a guitar given to Wayne — started, and how many thousands of kids it wound up helping. I’ve seen the results of gift programs like Angel Tree Program. 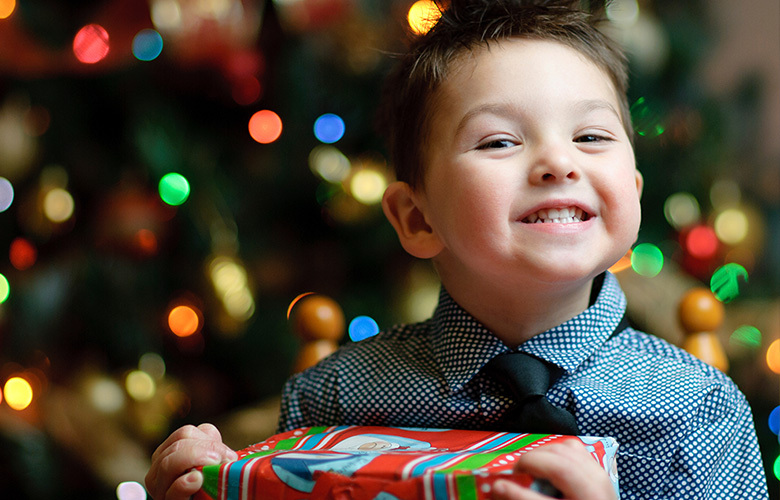 Parents who can’t afford gifts are ecstatic to be able to provide their kids with a holiday. The gifts are a relief for a parent who wants to give something to their kids; the parent knows their kids can clearly see what is going on around them at holiday time. Even the smallest gifts are treasures to kids who have so little. And, for kids who have no families, it’s a symbol that they aren’t forgotten and that someone cares about them. 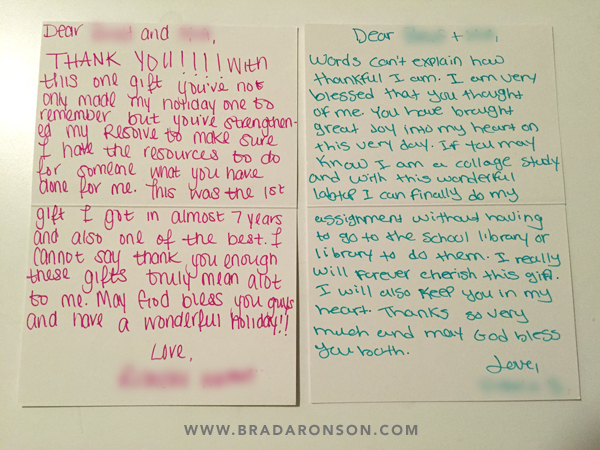 Notes from teenagers who received presents from holiday gift programs. The post office, Salvation Army’s Angel Tree Program, Toys for Tots and One Simple Wish all provide opportunities to give holiday gifts to kids in needs. Here are details about where you can find opportunities. One Simple Wish has a list of wishes from foster youth. The wishes are compiled by social workers and other professionals who work with children. Call your local Salvation Army to see if they have an Angel Tree Program. You can use the site’s zip code search to find your location. Some locations will allow businesses to take an entire tree for their lobby. Operation Letters to Santa. This site allows you to provide gifts to kids who write letters to Santa. Here’s their list of participating post offices. If your post office participates, call your post office for details. You can bring new unwrapped gifts to your local Toys for Tots drop off center. Toys for Tots is run by the U.S. Marine Corps Reserve and distributes toys across the U.S.
Other great places to contact are your local children’s hospital and your local homeless shelter. Want more positivity in your Facebook news feed? If you enjoyed this content, please consider clicking this link and liking my Facebook page. You’ll get inspirational stories, good news and a focus on the positive. (About one post a week.) Thanks! In the spirit of giving here are 98 Random Acts of Kindness that you can perform to help others and 24 ideas for raising kind and grateful kids.